You often see corn fritters on breakfast menus. There is no rule here. It is good not only for beautiful breakfast menu but also great for lunch or dinner depending on what you serve with. I, in fact, made this for my hubby’s lunch box for tomorrow. Corn is in season at the moment, packed with full of fibre, vitamin A, B and E. It is sweet and dancing in your mouth. Now onto sardines. Some might dislike its fishy taste and little visible bones in them, but you should be friends with them because they are an amazing nutritional punch. Sardines have a good amount of protein, healthy omega-3 fatty acids, calcium, iron and potassium. They are low on oceanic food chain which means low amount of mercury. Rich in vitamin D, yes, good for your bone health. So eat the sardines! It is great as a whole or smashed on fritters or toast. I made a balsamic onion relish and beetroot horseradish cream to go with the sardines so that they are not too fishy. Adding lemon, balsamic vinegar and olive oil can do a trick. Mix all of the ingredients in a large bowl and stir well to combine. Heat a pan on medium heat and drizzle with coconut oil. Add a heap tablespoon of batter into a pan and cook 1-2 minute each side until golden. I made four fritters with this batter. 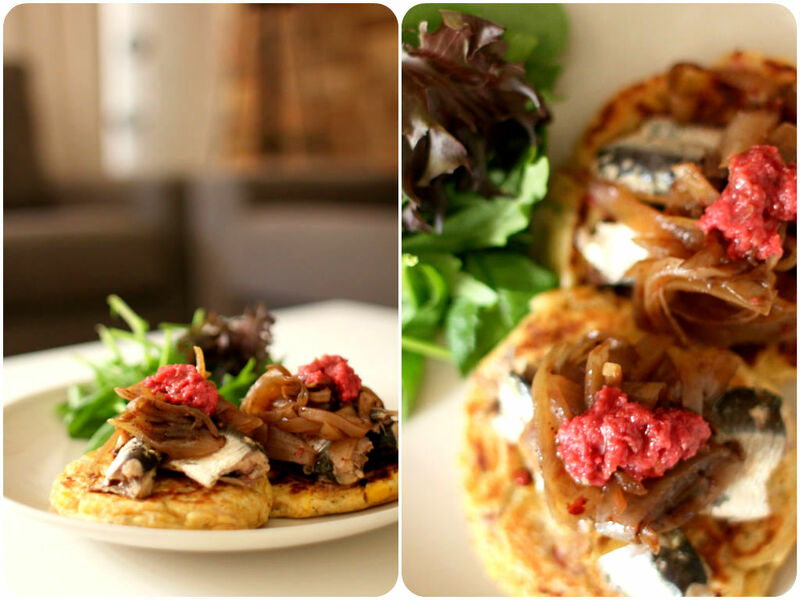 Serve sardines, balsamic onion relish and beetroot horseradish on the fritters. Drizzle olive oil and serve with green salad.